Cavernous and spiritual: There's a sadistic place of worship where man made, electronically manipulated sizzles and squeals can precede an otherwise beautiful and engaging piano and acoustic guitar duet, the disturbed instrumental, "In Fulminic Gaze," ritualized with heavy tom drums, the pulse beat anchoring waves of heavy feedback which find distance in their travels. The payoff is enthralling. Such is the nature of Bless Them That Curse You, the collaborative efforts of Chicago's noise metal champions, Locrian (members André Foisy, Terence Hannum and Steven Hess), and Seattle's experimental husband-wife combo, Mamiffer (pianist Faith Coloccia and ex-Isis member, Aaron Turner), which nurtures or punishes the coexistence of notes and tone, ambient noise and solid composition, experimental abstractions and anchored songwriting. A challenging listen, Bless Them That Curse You smartly capitalizes on the strengths both bands carry into their own projects, each side of the collaboration contributing to the overall design and character of each piece of anti-music. 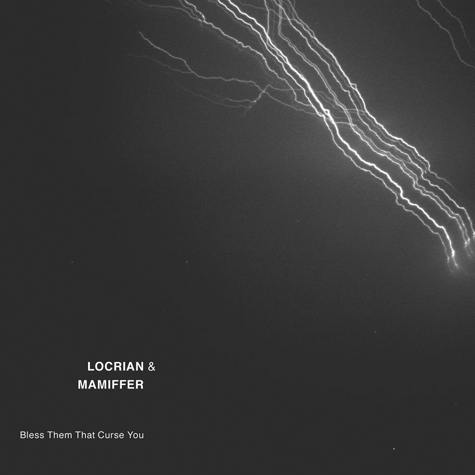 What Locrian and Mamiffer (or, "Locramiffer" — courtesy of Flingco Sound System) both bring to the table isn't always clear ("Bless Them That Curse You" and "Second Burial" both carry enough of Locrian's approach to soundscape to qualify as their own, though I'm sure they were able to do a lot more by simply expanding their ensemble), but wonderfully haunting moments like "Corpus Luteum" or "Lechatelierite" pay respects to both the music at the surface and the drifting sounds that wallow underneath, the distancing agent added that carries Faith Coloccia's keys into expansive thoroughfares they might otherwise never have discovered. "Lechatelierite" is especially minimal, Coloccia's fingers forceful and lasting upon their keys, the notes abrupt and borderline sporadic. There's intent, but liberty with the structure. "Bless Them That Curse You" is a tonally thick and trippy piece, evocative of something a band like Grails would perform. While I wouldn't outright attribute the music to or say it was inspired by drug culture, you could imagine somebody's episodic, chemically charged journey being aided by something like this as track's repetition and gradual lift could suggest the act of traversing space or circling within it. It's pleasant to the ear, no aural scarring or provocative strangeness to negotiate. Contrasting, though, is "Second Burial," which is a percussive stab at the ominous, cavernous expressions of sound that Locrian normally devise. The three part "Metis/Amaranthine/The Emperor," is a 19-minute suite that's carried at first by an angelically sung (Coloccia) and isolated piece of music, powered by piano chords and the gradual increase of dissonant tones and voices fading in and out of audibility. Enter a stinging onslaught of feedback and distortion, crunching sections of static crackling through the endless hiss. Voices emerge, throaty and long; drones and amplified pulsations. Drums appear for the third segment, which is carried to fruition by Aaron Turner's growl, a severity both abrupt and caustic that exhausts the mire beneath it. The album simply fades during one single distorted whistle and its emotional investment follows suit.